First, a bit of backstory: By the time I finally moved to Chicago in 2007 I had already been performing improv professionally for 5 years (and in some capacity for 7 years). Â During those years most of the energy I spent towards improv was focused entirely on performance. Weekly live shows in front of paid audiences were great experience, but they only afforded a very cursory glance Â what had gone right or wrong on a given night. As a group we would discuss the nightâ€™s show, but were only given a very limited number of opportunities for workshops, coaching, and improv education. When I arrived in the Windy City with the goal of becoming a better performer, I realized that my experience left me with a comedic worldview that was both a blessing and a curse. On one hand, I had an edge over other improvisers who were just starting out their love affair with the art form. I had already made it past the â€œhoneymoon phaseâ€ of being obsessed with everything improv, and saw myself as a capable and experienced performer. This lack of awareness (or maybe exaggerated sense of self) led me to see my first few classes in Chicago as a means to an end, rather than as an end unto themselves. In other words, I saw my classes at iO and Annoyance as an opportunity to â€œproveâ€ to my teachers that I was capable and already â€œknew what I was doingâ€. As if I needed merely to show those in decision-making roles that I was someone who already had it down. This all changed one week in my level 2 improv class at Annoyance with a truly remarkable (and honest) teacher who was able to break me of this mindset for good. Boom. My heart sank. I was devastated. I had never felt less like I â€œgot itâ€ since my first week of improv rehearsals years earlier. This was exactly the push I had needed to get over one of the most profound hurdles I had faced as an improviser. A harsh, pointed, personalized note was exactly the diamond edge I needed to cut through my arrogant exterior and get to the heart of what I should be doing as a performer, in service to the audience and my fellow players. Now, 11 years after the fact, I find myself embarking on a new journey where myself and fantastic group of experienced performers and teachers will try to fill the unfillable shoes of the great teachers that shaped our careers and performances over the years. Of course our goal as teachers is to introduce people to the art and hobby of improv, and with that the hope that they fall immediately and hopelessly in love with it the same way that we did years ago. But we also have a larger (and much more difficult) goal to mold our students into truly great performers. 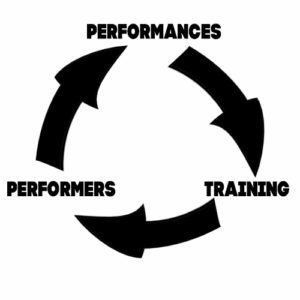 At Stomping Ground, transforming players into performers isnâ€™t just a hope, itâ€™s the entire goal of our comedic training program. Luckily, we have a strategy for this process that involves a lot more than showing our students what improv is and going through the motions of doing the improv exercises that one may learn in an introductory improv class. Improv curriculum isnâ€™t a secret or a magic formula. Anyone can buy the UCB Manual or Truth in Comedy or one of Mick Napierâ€™s books and read the exercises, or even get together with a group of friends and try them out. So why pay for improv classes? The difference is the instructor, and the experience and personal time and attention that teacher is willing to give to their students. Thatâ€™s why at Stomping Ground, we havenâ€™t just made it our hope to mentor and guide our students in their personal growth, but have made it the entire foundation of our training center. At each level starting with level 1, our students can expect to be given personal notes and feedback at each step along the way (and during class) that will pinpoint what they need at that time, so we can mold our students into the greatest possible performers. Itâ€™s always been the case that level 1 classes are a mixture of seasoned improvisers and those who are just dipping their toes into the comedy water, which is precisely why our teachers will tailor notes and curriculum to the individual level of the performer. The faster our students clear hurdles towards becoming better, the faster they’re ready to get on stage an inspire audiences to do the same. One of the worst feelings you can have as a student is not being sure where you stand, not being certain of what you need to work on personally, and feeling like classes arenâ€™t giving you the tools you need to continually improve. Hopefully open communication, lots of individual notes and feedback, and the transparency of a true meritocracy that serves the audience will leave our students knowing exactly what they need to get on stage, get over a hurdle, or improve at whatever aspect of their performance they personally feel needs the most attention. If you would, please take a look at this dope drawing I made in photoshop that hopefully encapsulates our training philosophy not just as a means to get class revenue, but as a goal of creating a community where learning and improvement is the goal, and making audiences laugh is the reward. Please, come learn with us and take your talent to new heights. Weâ€™re ready to teach you.